One of the minibuses that service the center of Florence. You'll rarely need to use Florence's efficient bus system since the city is so wonderfully compact. Many visitors accustomed to big cities like Rome step off their arriving train and onto a city bus out of habit, aiming to reach the center. Problem is, unlike in most other major European cities, the Florence train station is already in the historic center; ride more than ten minutes on the bus and you'll find yourself out in the suburbs. Seriously. The cathedral is a mere five– to seven-minute walk from the train station. In fact, it only takes about a half an hour's stroll to traverse the city from one end to the other. However, to get your bags from the station to your hotel, or to visit the most outlying attractions (see sidebar), the bus system might prove useful. 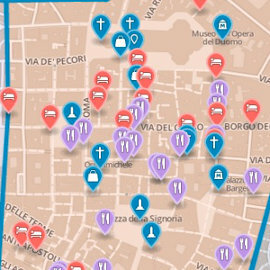 Almost all buses begin, end, or stop at Piazza Stazione, in front of the main train station, Santa Maria Novella. many also pass through Piazza San Marco (near the Accademia and its David). Except for the minibuses (see below), the historic center itself is not very well serviced—though line 23 is useful (see sidebar below). You can see maps of the lines at the ATAF bus service website (www.ataf.net). There are four lines of minibuses, which used to be sensibly designated as lines A, B, C, and D, but which are now called C1, C2, C3, and D. These trundle around the historic center. Again, this area is so small most visitors will have no trouble walking from place to place. Also, it must be said that the buses don't follow the most logical routes for tourists, just ones that manage to work around the pedestrian zones and Byzantine system of one-way streets (in other words; they tend to go the long way around to get to the major sights). However, for the mobility impaired, these minibuses have been a welcome relief. I'm getting off! - scendo! 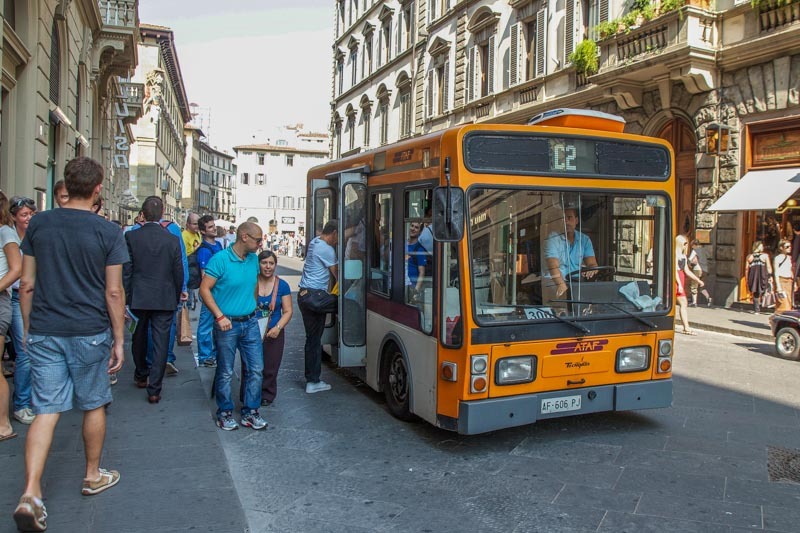 A regular bus ticket in Florence costs €1.20 and is valid for 90 minutes once you validate it. You validate it by stamping one end in the machine on the first bus you board. You are allowed unlimited transfers within the 90 minutes, but must stamp the other end of the ticket when you board the final bus. There's little point in buying the 24-hour ticket (€5) or three-day ticket (€12, let alone the seven-day ticket (€18). You can buy bus tickets at most newsstands and tabacchi (tobacconists)—which means any shop (often including bars and cafes) marked by a sign with a white "T" on a brown background. There are also ticket machines placed near 500 parking kiosk/meters around Florence. These tickets are validated the moment you buy them (no need to stamp on the bus), and remain valid for 80 minutes from the time you purchase them. If you wait to buy a ticket on board the bus (there's a machine on board), it costs €2. You can also ride the bus system using your Firenze Card museum entry pass.